DO YOU KILL THE BEES FOR JEWELRY? Never! All honeybees died of natural causes, and I get them from amazing small bee keepers in the USA. *All are from healthy and well-cared for hives. * The keepers simply scoop up the dead ones for me they find around their hives. Depending on their role in the hive and the time of year they are raised, most workers and drones live from just a few weeks to up 6 months (if they survive the winter by huddling around the Queen). 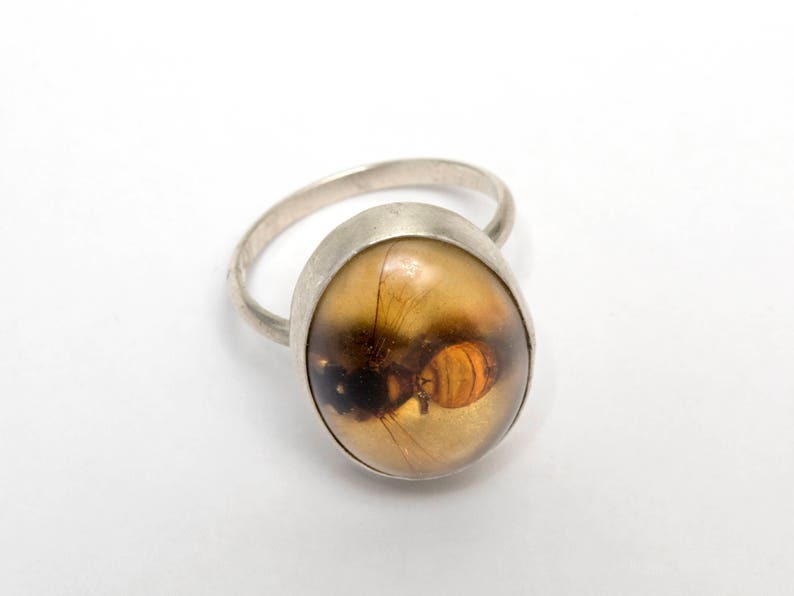 The bee cabochon (the oval casting of the bee) measures about 1/2" across, and is about 1/4" high. I make every single ring out of sheet metal, piercing and soldering the all the pieces from sheet silver. To make the bee focal point, I collect the dried-out bees, then place them in molds and build up layers of epoxy resin around them. At the end, I add a layer of gold leaf, then set them in the sterling silver bezel. It ends up having this lovely amber glow when the light hits it. Restore shine to the resin with a fingernail buffer. The silver ring can be polished up with any silver cloth, though it should self-polish from regular wear. Available in either US sizes or adjustable. A friend admired my brass jellyfish necklace from this seller, so I surprised her with a brass squid necklace. She was delighted! Sweet, delicate ring. Fast shipment and super nice seller!! Thank you Jenny!